Prior to joining this hospital, Dr. Shikare worked as a Lecturer and then an Associate Professor of Nuclear Medicine at Seth G.S. Medical College and K.E.M. Hospital, Bombay, India for seven years. 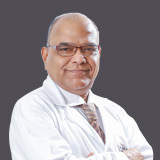 He subsequently worked as a Consultant and Head of Nuclear Medicine Department at Dr. Balabhai Nanavati Hospital, Bombay, India for three years. Dr. Shikare has several national and international publications on his name.